A High Quality Entry-Level Fume & Dust Collector for Laser Engraving, Coding, Marking & More with an Advanced Long-Lasting HEPA & Special Carbon Filter Air Scrubbing System that Specifically Removes The Unique Chemical Gases, Vapors & VOC's Created by Lasers. An Excellent Choice for VersaLASER & Similar Small-Bed Lasers Systems. Best for: Fume & Dust Removal with Small-Bed Laser Cutting, Marking, Coding & Similar Sized Lasers. Great for Small Enclosed Lasers with No Exhaust Fan. 106 CFM Airflow - Good for Lasers with Exhaust CFM of 106 CFM or Less, Small Enclosed Beds w/ No Exhaust, etc. Remote stop / start interface--turns the extractor on when the laser comes on. Just because a laser is smaller doesn't mean you can get away with using a cheap air purifier. Smaller laser systems produce many of the same harmful fumes and dust as larger systems and need proper fume and dust removal to maintain a safe, healthy and productive work space. Cheap air cleaners often make matters worse because without the right filters to remove, pollutants, many harmful substances pass right through to be circulated more, creating more of a hazard. 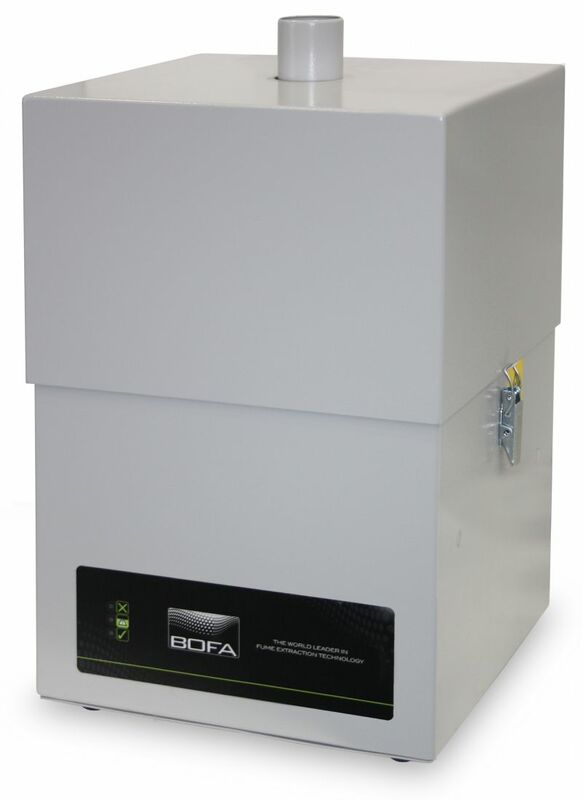 The BOFA AD Access is the perfect answer to smaller laser system air purification needs. The AD Access offers a powerful 3-stage filtration system that includes BOFA's famous DeepPleat pre filter, HEPA and chemical removal section. BOFA’s Advantage (AD) Access fume extraction and filtration system effectively removes more than 99% of potentially harmful fumes and particulates created during the laser marking, coding, engraving and light duty cutting processes--without having to duct outside. That means you can work virtually anywhere and breathe clean air while you create and run your business. 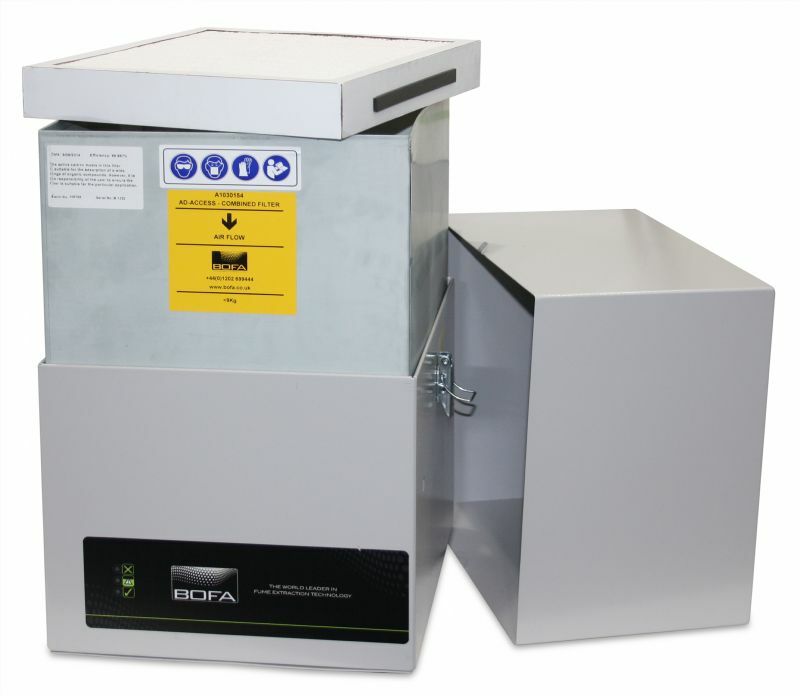 Order your BOFA AD Access Laser Fume & Dust Extractor today here at a discount online sales price and enjoy clean, safe air in your shop, and higher profits. If you have any questions, give our specialists a call toll-free at 1-800-701-2513. We are here to help! Add Standard Hose Connection Kit? Add Replacement Combined HEPA Carbon Fiilter?